« Bye, Bye, Dr Halse! 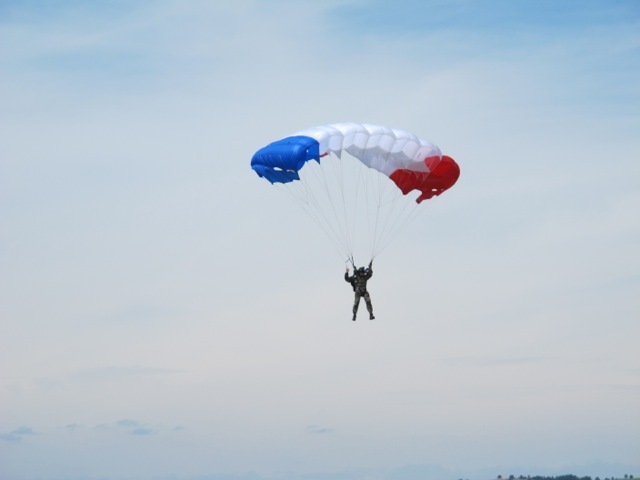 …for four French paratroopers to fall from the sky. 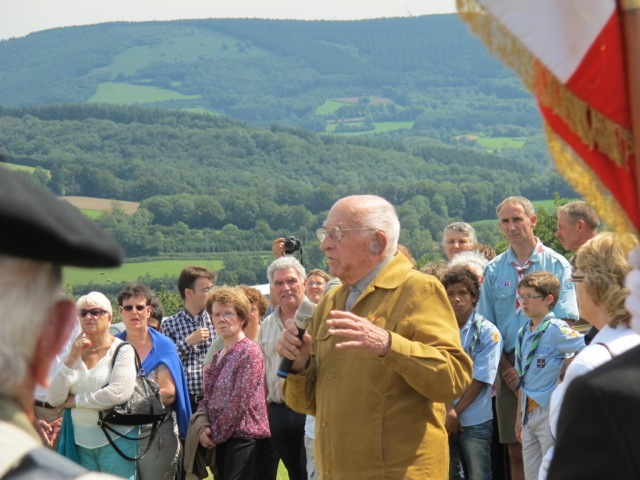 Both the crowd on the ground and the “angels” about to descend, were–perhaps unknowingly–re-enacting events that happened here, in an occupied wartime France, 70 years ago. 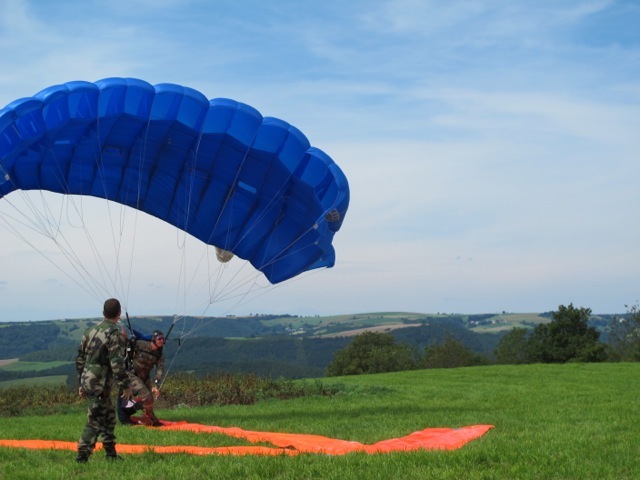 In early August 1944 the Allies organized several parachute missions to deliver weapons, supplies and soldiers to the resistance fighters in the Tarn. 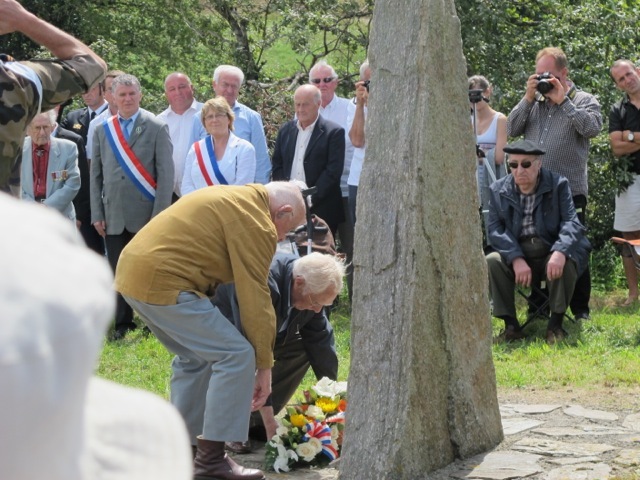 The German occupation forces got wind of one of these midnight drops and on the night of August 8th, they attacked the drop zone killing seven young maquis fighters. Their sacrifice was being remembered and honored at Saturday’s event. In 1944 Guy de Rouville (below) was commander of the Maquis of Vabre–the Resistance group in charge of the secret drop zone. He was 29 years old. At 99 his memory of these events is remarkable and his enthusiasm to communicate it, undiminished. Guy de Rouville laying flowers in honor of the slain young men whom he had once commanded. Guy, in full flood, telling his story. 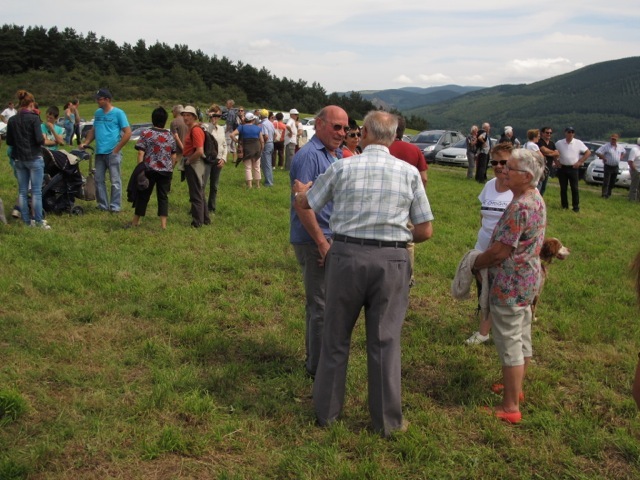 Guy and his wife, Odile (96), still live in the hill village of Vabre, where they once welcomed a young English major and two French officers from the Jedburgh mission who had parachuted onto this hillside on the night of the 8th August 1944. The previous night they had taken in an American soldier who had broken his leg landing in the same drop zone with 14 comrades. They were an OSS commando unit sent from a base in North Africa to support local partisans and disrupt the German supply lines before the still little-known southern D-Day landings near St. Tropez on 15th August 1944. 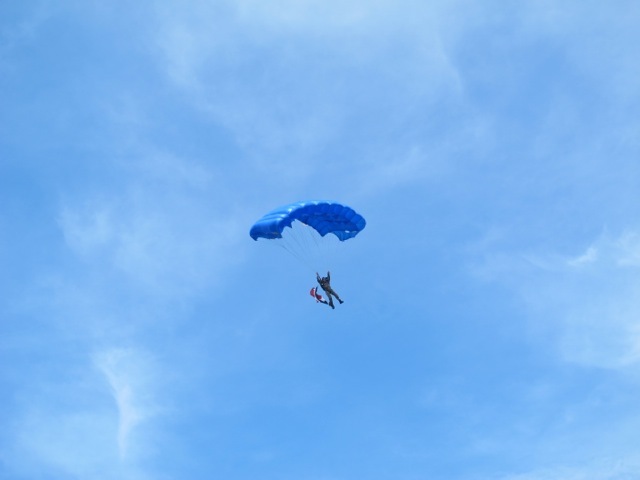 All the parachute drops, made under cover of darkness and in a remote place, put the local population in peril on a day to day basis from the Nazi occupation forces. 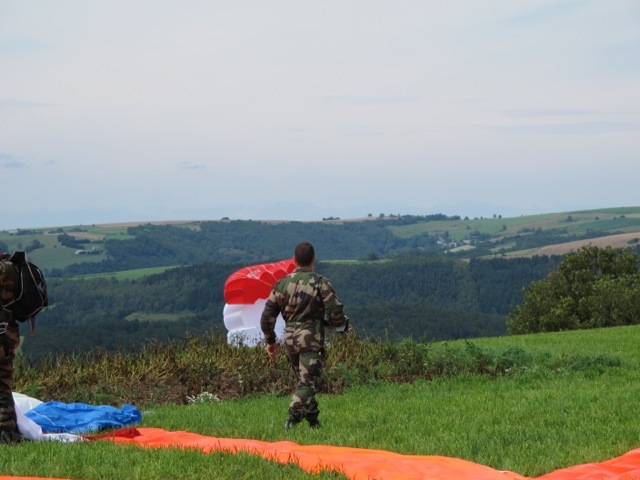 The drop zone is on the opposite side of the valley from Vabre near the village of Viane. 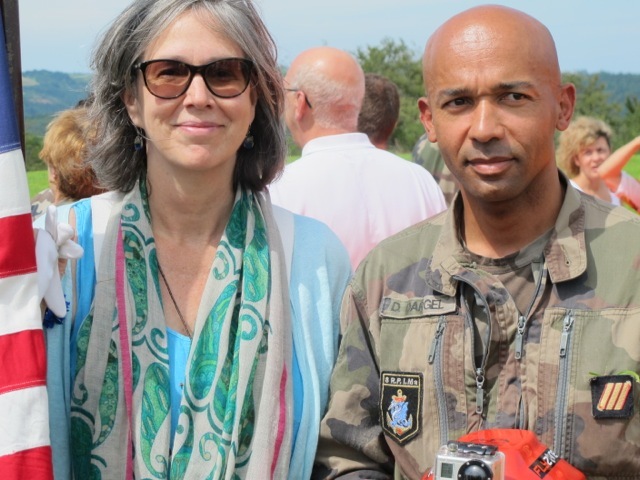 Viane is en fete this weekend and murmurs were heard about the commemoration stealing its thunder. 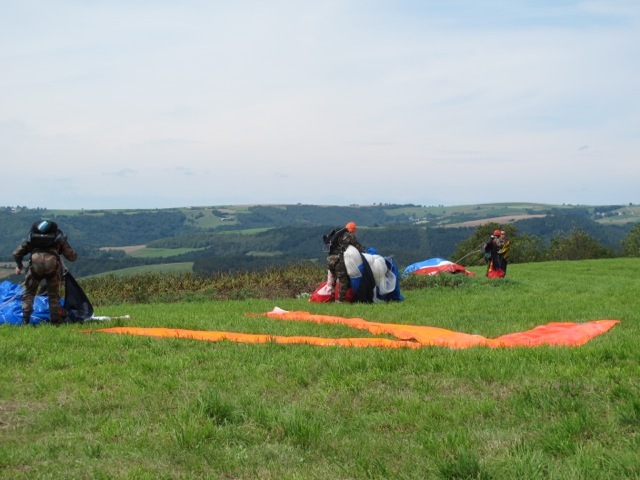 Small murmerings–most of the crowd, like us, were looking forward to the parachute jump by the 8th RPIM (8e régiment de parachutistes d’infanterie de marine) based in nearby Castres. 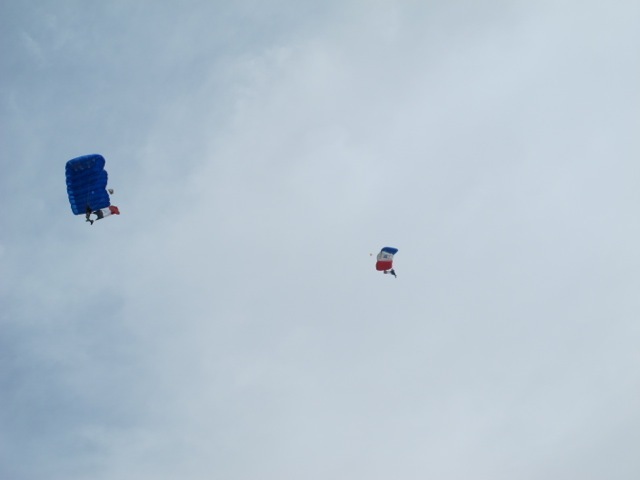 …and the fourth was within twenty feet or so. Meredith and “an angel that fell from the sky”! Guy stands with today’s “angels”, 70 years after he welcomed the war-time flights. Meredith is an American porte drapeau, carrying the American flag at ceremonies of remembrance in the region. 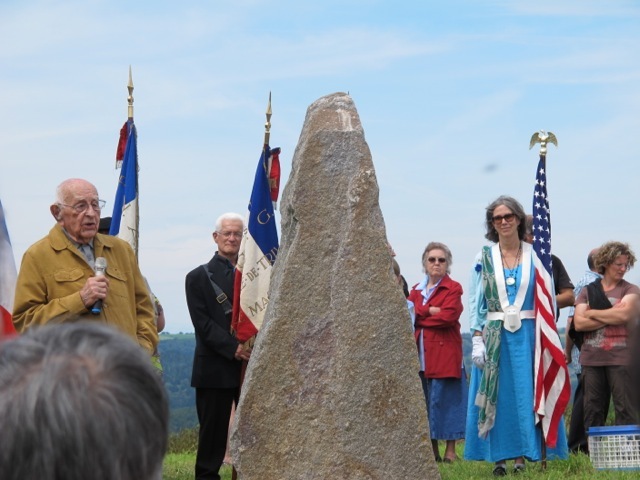 It was at one of these ceremonies where she heard the story of the American OSS team’s landing and their vital contribution to the liberation of the south Tarn two weeks after their arrival. She received a Fulbright grant to document the history of that mission, interviewing most of the surviving members of the maquis group involved with the OSS mission. Two of the OSS men were killed in action in the Tarn. 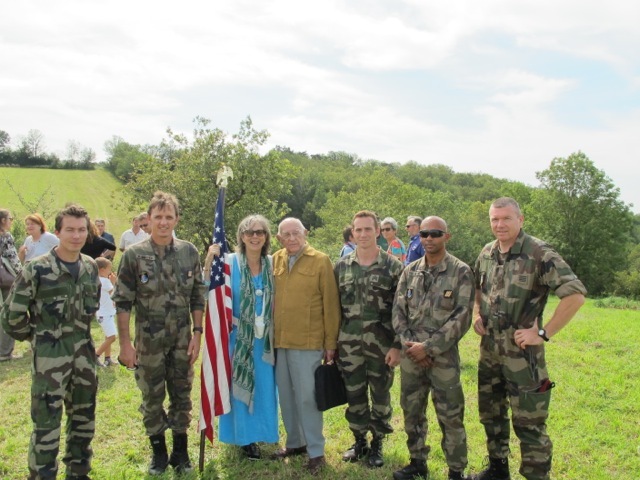 Their sacrifice and the memory of their deeds are honored by French veterans every year here–sometimes in the presence of American family members who come to see where their loved ones served. 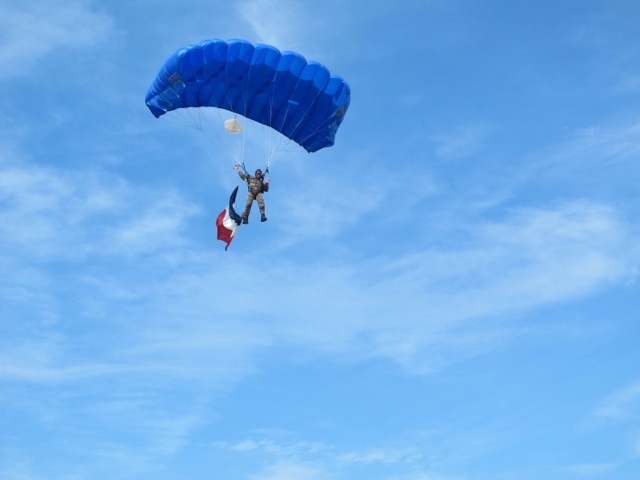 Unlike the French paratroopers we watched Saturday, the OSS and the Jedburgh teams parachuted at night, laden with heavy equipment, into occupied France–with little idea what awaited them. Their courage has never been forgotten here. Meredith looks great! Very moving account, Robin. Thanks for sharing. and congratulations to Meredith for the honor. Much as I delight in your recipes, I have been fascinated by your World War posts! Many thanks to you and Meredith for making this little-known chapter in the liberation of France better known to us all. And congratulations to Meredith for carrying the flag–literally as well as figuratively–in its retelling. Great post Robin! The greatest generation indeed. Thanks for representing the Americans Meredith!! And thanks for gathering the stories! and long remembered and honored here. Thank you so much for this remembrance. It is so important for the newer generations to be reminded of the terrible and indeed courageous sacrifices and courage of those in WWII. Thank you for sharing this little-known part of history on your blog. It is in retelling these stories to a wider audience that we will ensure such courage is NOT forgotten. Thank you both for sharing these acts of remembrance. with us in words and pictures.It must never be forgotten the bravery of not just the troops but the people on the ground in the area who helped so many at great risk to themselves.Thank you. I didn’t know about this and now I do. Thanks to the two of you. Beautiful remembrance of an event I did not even know had happened. The courage and sacrifice of so many who stepped up to the plate and did these kinds of heroic deeds in the face of extreme danger and were willing to risk death if need be to save others – to help – to do the right thing – absolutely astounds me. Thank you for this tribute, comments and pictures are perfect! One of the things that fascinates me about Europe is the history. That sounds incredibly trite, of course it has history. But I mean history as it was wrought by individuals. When I see photos of towns and homes that I know date to before the war, I invariably wonder about the occupants of the time. Did they resist? Did they collaborate? What went on within those walls? How amazing that there was so much bravery. And thank God those brave individuals, such as Guy and Odile, tipped the scales against the ones who perpetrated so much evil. Thank you so much for this post, Robin!